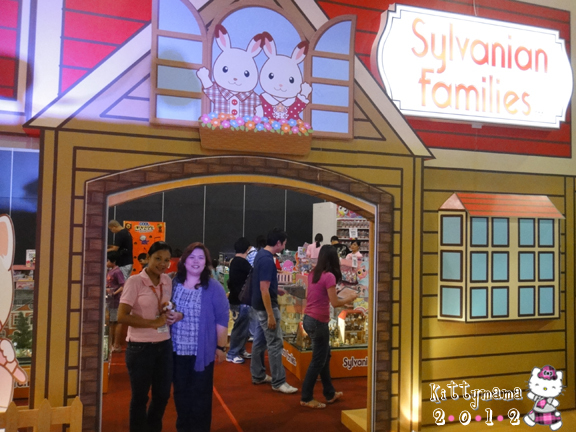 Ban Kee Trading, Inc., the official distributor of Sylvanian Families toys in the Philippines, held its annual Trade Show at the Shangri-La Hotel last Friday, September 4, 2015. 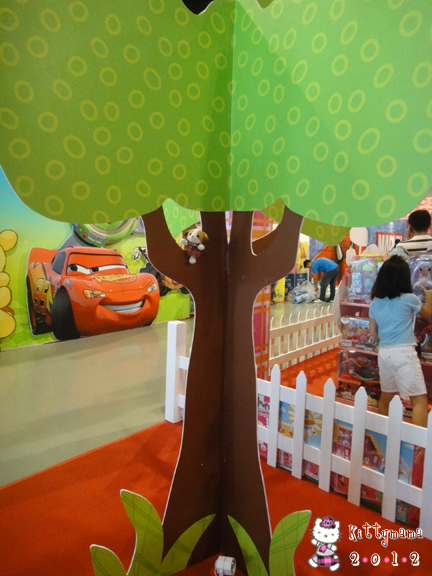 The trade show featured the company’s impressive line-up of well-loved toys and baby products; it also showcased new items for the coming holiday season. The whole day affair was by invitation only, with Ban Kee’s clients, business partners, and special guests in attendance. For almost 30 years, Ban Kee has brought to the local market a wide variety of toys and baby products. Partnering with some of the largest and most trusted names in the children’s market industry, Ban Kee has made these once inaccessible products readily available and at reasonable cost to local consumers. 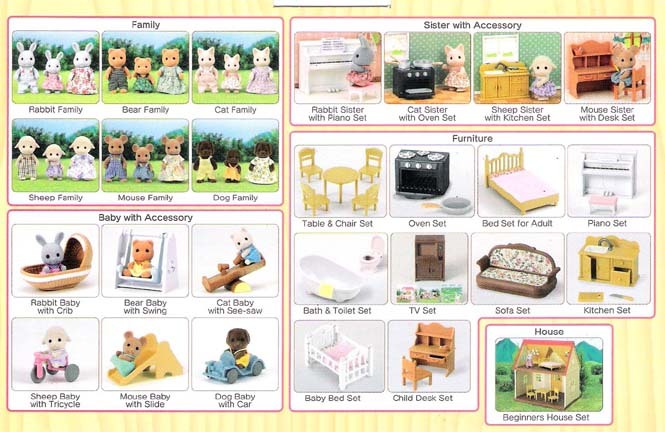 One of their most well-loved products, Epoch’s Sylvanian Families, has experienced a resurgence in collectors’ interests, caused in large part by the effective marketing of the toy line. This included a special dedication to the creation of charming, whimsical displays that are outstanding advertisements for the brand the world over. 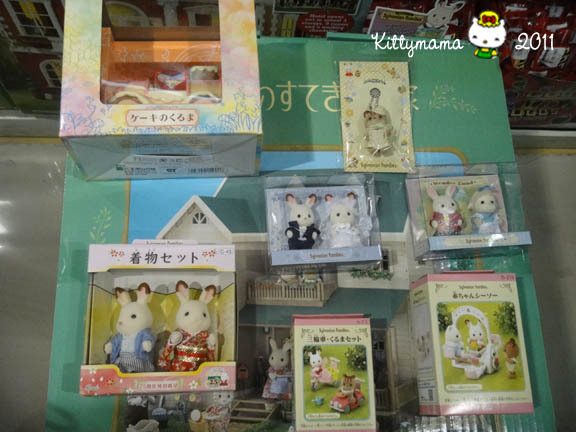 Although Sylvanian Families is said to cater to the upper end of the market, Ban Kee’s efforts to bring in a more diversified line helped create new enthusiasts and renew flagging interests of the older collectors. 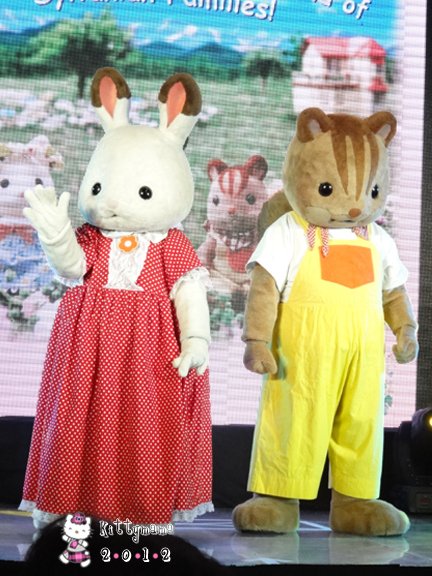 For 2015, the Seaside series comprise the bulk of Ban Kee’s Sylvanian Families offerings. 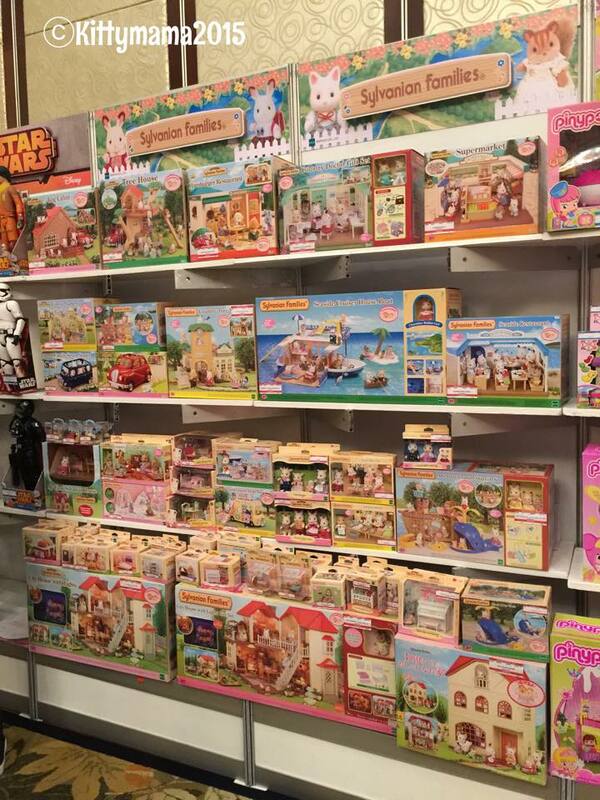 These newest themed play sets which can be purchased as individual pieces or as gift sets are still available in toy stores all over the country. 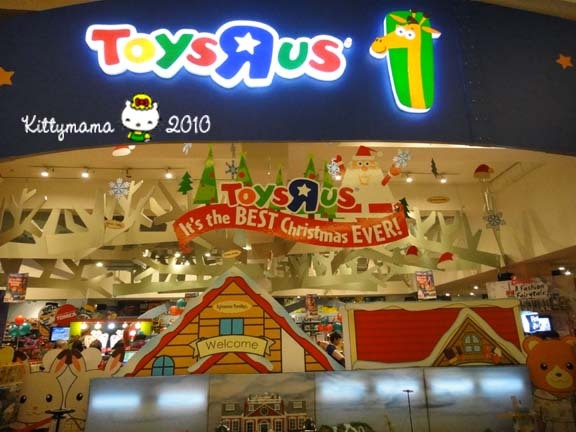 As an adjunct to brick and mortar stores, ToyTown, Ban Kee’s retailer arm, has also partnered with Lazada, a popular e-commerce site, to beef up its online presence and bring their products to other parts of the country. 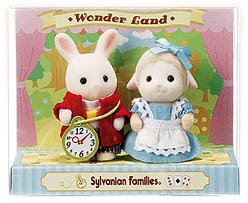 Aside from the featured products, the Trade Show also brought in another piece of good news for Sylvanian collectors. 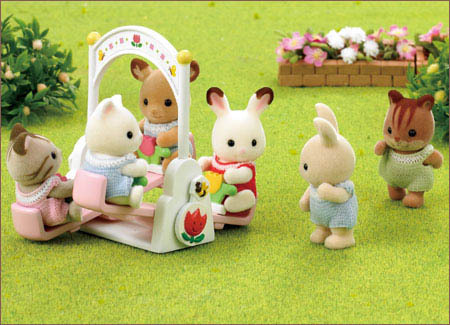 In the works is a special 30th Sylvanian Families Anniversary celebration, with commemorative events, sales, and activities for the diehard Sylvanian fan. (Me! Me!) Even as I write this, details of the said event are already being ironed out. I will follow up this news and update local fans accordingly. I hope that Ban Kee Trading is able to bring in the newer releases of the Seaside series. 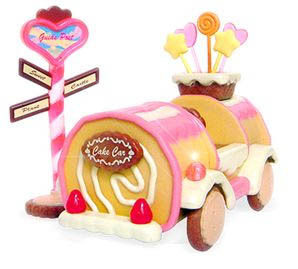 We’re keen on the new ice cream parlor, the adventure figure set, and the merry-go-round. One thing for sure, there’s loads of fun (and education!) to be had with Ban Kee’s choices of toys. And if the Trade Show is any indication of just how much fun it’ll be, there’s plenty to look forward to in 2016 and in the coming years. This was one swell weekend! I haven’t had so much fun in ages that writing about it (and blabbering on and on and on) is simply too easy. Aside from the Gift Gate Big Sale at the NBC Tent last Saturday, there was one other major event for collectors in the city this weekend. 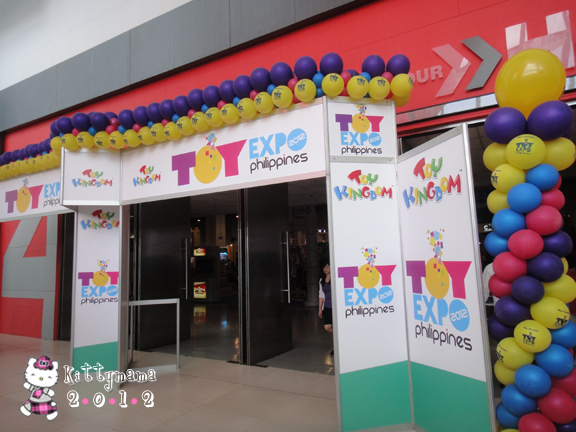 This was the four-day Toy Kingdom Toy Expo, the very first one in the country, which ran from August 23 to August 26 at the SM Mall of Asia SMX. 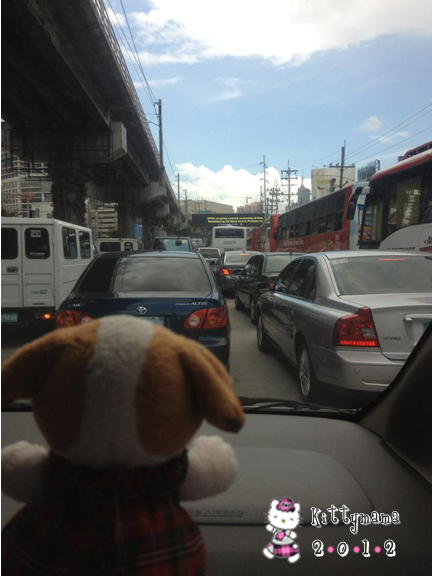 On the way to SMX, we were met with traffic along parts of EDSA. 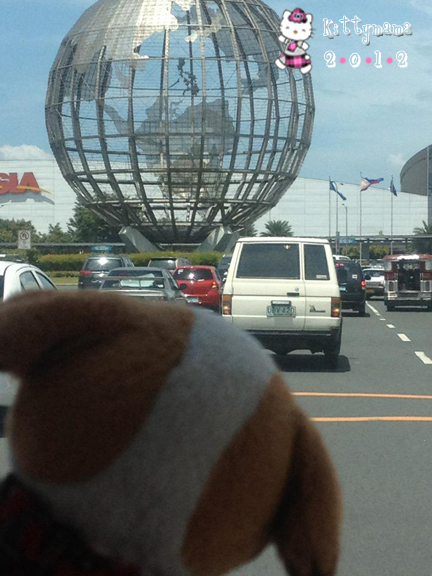 I couldn’t help but wonder- were they going to the Toy Expo too? Fortunately, we got to the area in record time! “I’m almost there, Toy Expo!” I whispered to myself. 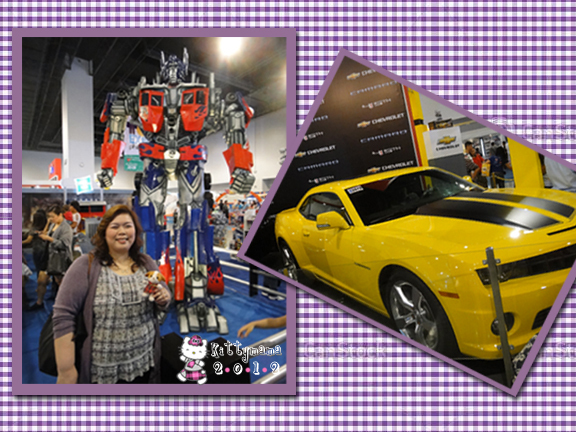 Had to take pictures of my favorite Transformers OP and Bumblebee (Go, Autobots!). Here are some quck peeks into some of the most interesting sights (for me, at least): the X-box Kinect area (I wastched that lovely young girl dance), Barbie and her fashionable “house” (all the while wishing Cha, one of my dearest friends, was there), Lego’s super-creative Philippine sights, and Monster dolls (this was not for me, but for some of my friends who are into these ghoulish, yet, fashionable dolls). 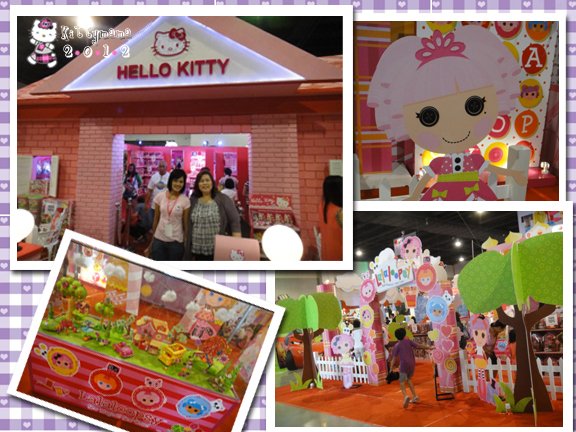 Ahh, but nothing beats Hello Kitty… and Lalaloopsy! There’s Ms. Beth in the picture with me (Ms. Beth is one of Ban Kee Trading’s wonderful sales persons) and lots more of the Lalaloopsy section. Believe me, if I had my own little girl, I think we’d have stayed forever with the Lalaloopsy girls! 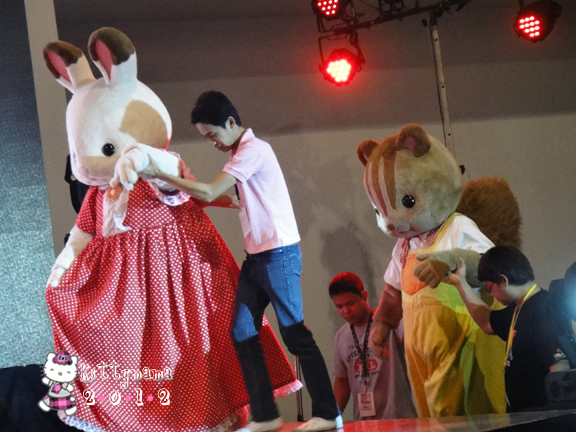 Ms. Aileen, also of Ban Kee Toys, was ever so gracious and accommodating. She showed me around the display area and gave me a short feedback on people’s response to this particular segment of the Expo. Of course, they loved it! Duh! 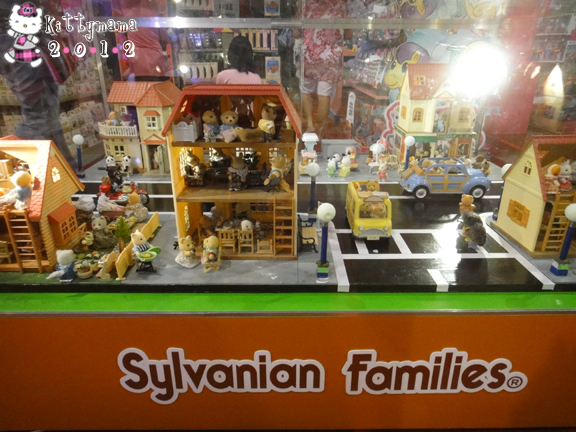 I ♥ the Sylvanian displays! I’ve seen them a hundred times before and I never get tired of looking at them. I want to live in this neighborhood! For the Toy Expo. 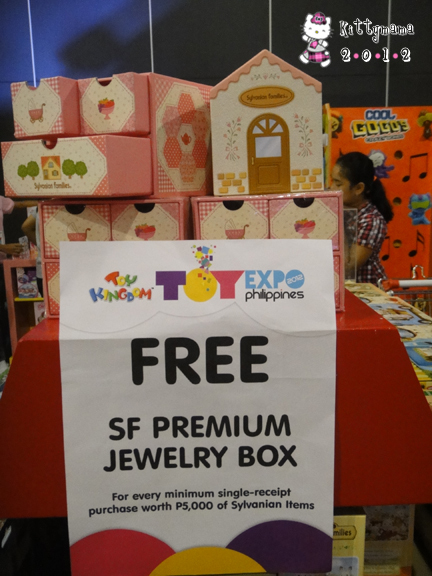 Ban Kee Toys offered a special promo of a Sylvanian jewelry box for every purchase of PhP5000 and above. *Sigh* These made me wish I hadn’t bought everything yet! Ahhh, despite my inability to avail of the promo, there was another highlight to the day. 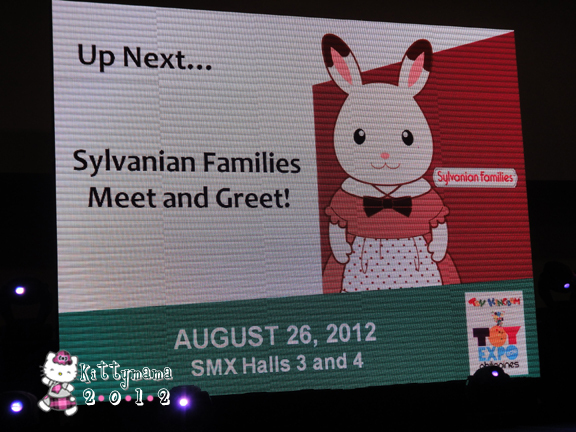 The Sylvanian Families Meet and Greet was my most favorite event at the Expo! “Careful, Freya and Douglas!” we shouted at them as they ascended thestage. “I just knew this was going to be an extra special day,” Douglas thought to himself. 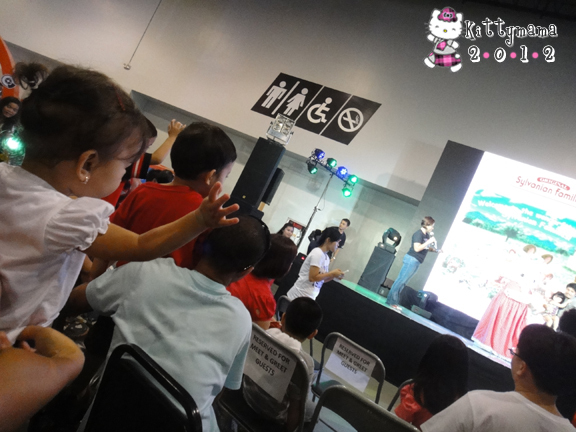 Freya couldn’t stop waving at the enthusiatic crowd. I was the biggest there! Little Karen Doughty had to have her picture taken too. See her yet? She’s so tiny compared to her giant relatives! After all the pictures, it was time to go home. But Karen was nowhere to be found? Can you guess where she was? “I’m hiding, I’m hiding!” Karen seemed to say, as she holed out in the Lalaloopsy garden. Now, will there be another one next year? We certainly hope so! Thanks, Toy Kingdom! 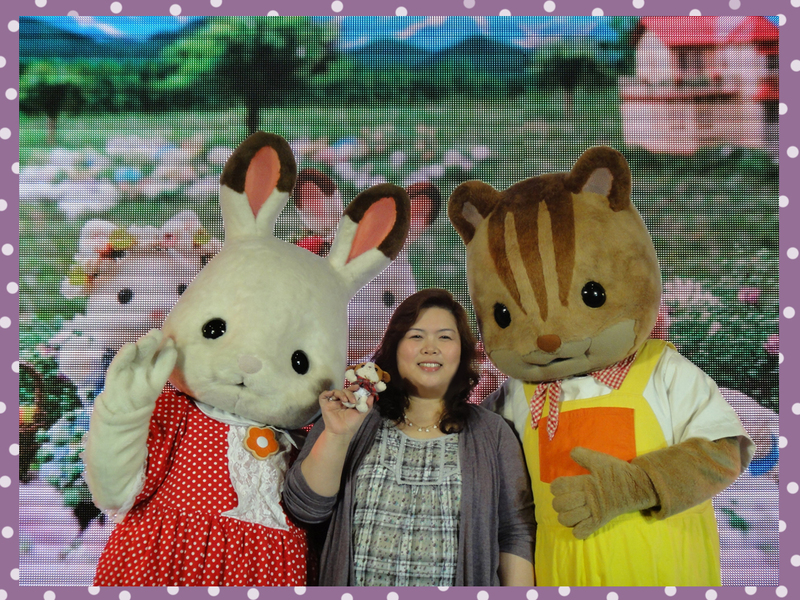 Great news for all Sylvanian collectors in the country: Ban Kee Trading Inc., official distributor of Sylvanian Families in the Philippines, has launched a new promotion to run from September 1, 2011 till November 30, 2011 in Toy Kingdom and Toy Express outlets. 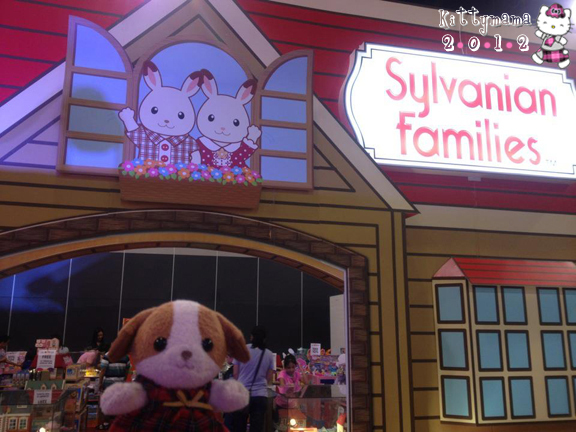 The promotion, called Sylvanian Families Passport, allows collectors to buy their way to the top prize, a deluxe three-story Sylvanian Families JP house, while enjoying premium items along the way. Every PhP1000 purchase qualifies for a stamp in your passport. Collect enough stamps and you get to bring home premium items (these are not available for sale in the local market). I have to give thanks to the Brands Department Manager for Sylvanian Families of Ban Kee, Mr. Joseph de Leon, for the news. He also gave us hints on what to look forward to in the coming months- new releases and plans for a big exhibit near the holidays. I can’t wait to see what he has in store for us! Of course, after hearing of this latest development, I did my homework and actually went to the store to check it out. My gratitude to Benjo of TK SM North EDSA for explaining the salient points of the promotion to me. 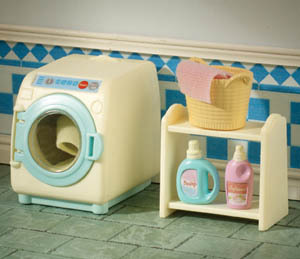 Open to all Sylvanian Families Collectors/ Aficionados. 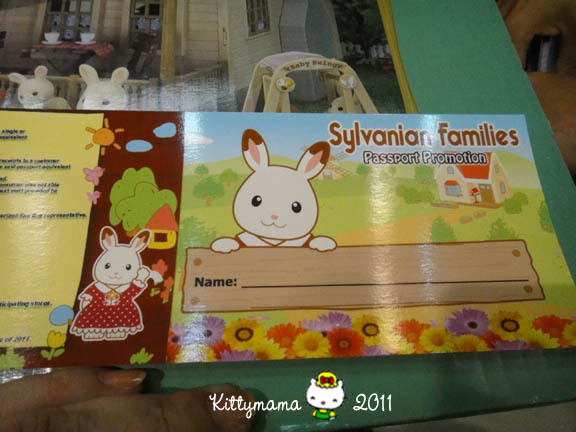 For every purchase of PhP1000 worth of Sylvanian products, single or accumulated, customers automatically get a passport with one (1) equivalent stamp earned. e.g. A PhP2000 worth of purchase would earn two (2) stamps. Accumulated receipts are allowed but should be from the same store. For every succeeding purchases worth PhP1000, simply present receipts to a customer service or authorized Ban Kee representative with ID who will stamp the said passport equivalent of purchased amount. Collect stamps to reach target points and redeem premium items assigned. Present passport and receipts to get corresponding stamp/s. In case a consumer was not able to bring his/her passport, he/she can still claim his/her stamp/s on his/her next visit provided he/she presents his/her passport to the same store he purchased the items. Accumulation of stamps is valid in any participating stores. First row must be completed before proceeding to the next row. Once stamps have been completed, passport must be surrendered to an authorized Ban Kee representative. Promo duration is from September 1, 2011 to November 30, 2011. Redemption period shall be up to 60 days from end of promo period in any of the participating stores. Combined stamps from a separate passport will not be honored. Cannot be used in conjunction with other promo/s. 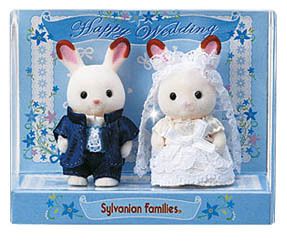 Now, I’ll answer the question that’s on every Sylvanian collector’s mind: what are the premium items we can get for free? Hold your breath, friends! Don’t believe all these are possible? What if I tell you they’re all waiting for you at the nearest Toy Kingdom and Toy Express stores? I knew I’d have to prove these to you so I took pictures! And the three-storey that’s to die for…haaayy!!! This is a very exciting time for local collectors. We have a lot of wonderful items to choose from these days, and our in-store SF displays now match those found in Singapore and Hong Kong in detail and beauty. I only wish we had this much earlier so I could have paced my buying sprees to garner prizes. 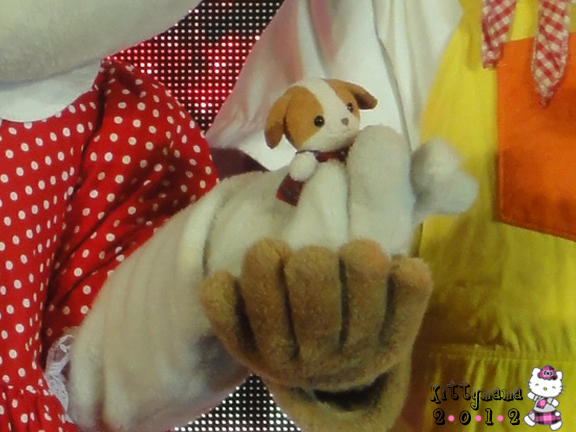 Still, I have my eye on some doubles and triples… but let’s not tell A♥ all about it first, okay? With Christmas just eight days away, I feel the mounting pressure of finishing our family’s shopping list. This is the latest we have ever been in all of A and my years of shared holiday shopping and right now, I am feeling a little overwhelmed. There are last minute sales all over the city and all one needs is a little patience and lot of time to go through them. I have never been short on patience but it seems I am running out of time. While I hyperventilate and deal with anxiety issues, who else would come to my rescue but my dear, sweet A? The other day, coming from a work meeting, he brought home two packages for me. First, he handed me my most recent package from BeHappy Malaysia. I was already feeling giddy; I had been waiting for that for a couple of weeks. And then he hands me an unexpected surprise and it was huge! It would be my first Christmas gift of the season and it was an absolute thrill to receive it from him. Then too, he was so excited to see me open the gift that I only had a few seconds to take pictures before we both started ripping the glossy wrapper. I closed my eyes and held my breath… and voila! 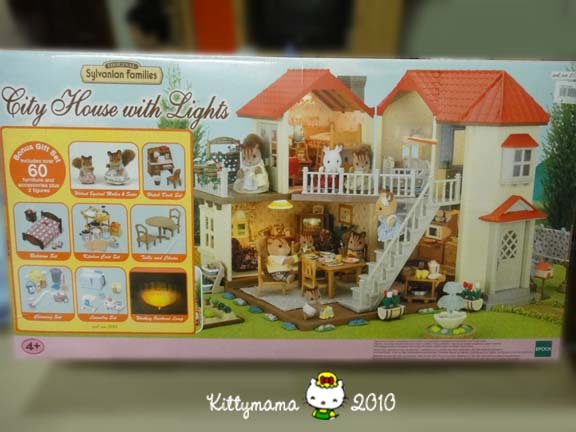 This is the new Sylvanian Families Beechwood Hall or what Epoch Euro still calls the City House with Lights. Updated with new, fresher colors, a landing for the second floor and a reversible play area in the ground floor, this new home is a major improvement over the old Willow Hall and addresses many of the problems the old home was well known for. The room sizes remain small as the overall size of the house remains the same, but the addition of the landing and reversible play area adds up to a better play experience. Moreover, the bonus sets that come with this package make it more pocket friendly. Some of the items included are not even sold in the country as individual sets. 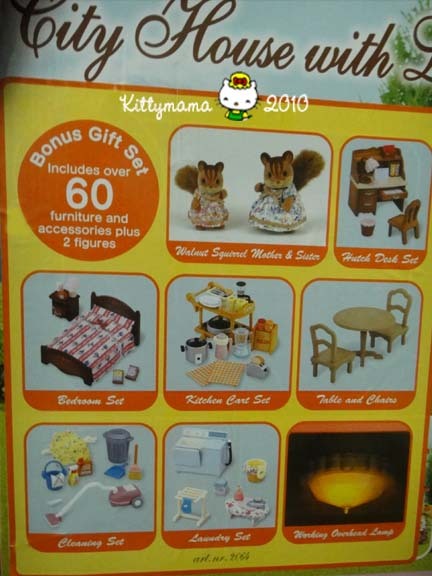 A similar gift set was sold in the United States a while back under the Calico Critters brand and carries most of the bonus items, but not all. 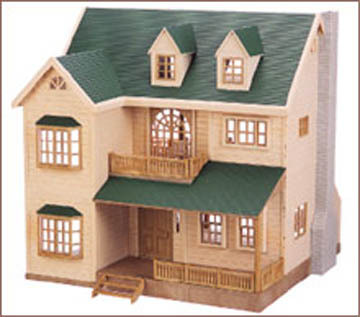 I’m setting this house up for the Christmas diorama I would like to build in the living room. I have enough different playsets to personalize this house, but I fear I will not have enough time to paper the rooms or make additional carpets. Still, I can imagine how the house will look when I add the Christmas tree and Santa Bear. Also, I have a miniature creche to add the real spirit of the season to this holiday home. If you want to see upclose the bonus sets that came with this purchase, here is a closer look at the sticker prominently displayed in front of the box. I’ve never really been embarrassed about my SF collections. 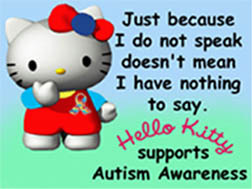 Perhaps it’s because people already know me as a crazy Hello Kitty lady and have grown to accept me as such; one more “craziness” won’t change their perception of me. I am lucky that like some of you here, my husband supports my collection and buys them for me without hesitation (but always within reason). As a collector of 80’s Japanese robots and Transformers toys, he possesses the mindset of a fellow toy collector. On occasion, he lets me play with his toys and I let him play with mine. It’s a playful marriage all in all, haha. There are those who do not understand, and they probably never will. There are some relatives who question the sanity of this midlifer. There are also those relatives who think money should be put on other things, like an Hermes bag or Tiffany jewelry. These, they say, have real worth and can be put back in the market without depreciation. But when I think about the reasons why I collect SFs, ultimately, my collection is only as valuable as the happiness I derive from it. Thank you, honey, for making all my Christmas wishes come true. Your love is my most precious gift and I could never ask for more. I promised Toukkero, my forum friend, that I will post pictures of the red deer family by Flair. I think she was surprised to find them as part of Flair’s lineup; honestly, so was I. I was prepared to shell out some money for Epoch JP figures but I was hoping to buy them sometime in the future when their prices had gone down a bit. Imagine my surprise when I found these beauties at Rustan’s Toy Department (first at Rustan’s Shangri-La and next at Rustan’s Glorietta 4) a week earlier than their release at Toys”R”Us Rockwell. A few days later, I found these lovely critters on my sick bed, a very thoughtful get-well-soon gift from my husband. I am very appreciative of Ban Kee Trading’s efforts to bring different items to the Philippines. We may be a young market but we are a vigorous one. 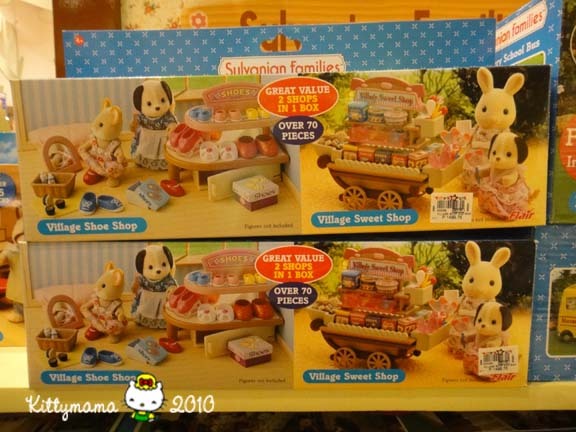 Of course, one can always pick up more Sylvanian Families in different parts of the world but having them here diminishes the stress of bringing home oversized, overweight luggage and packages. You know how Filipinos love balikbayan (literally translated as “return home”) boxes filled with presents for relatives and friends? Finding that many of the brands and services we love abroad are already here saves us not only worry, but time and lots of money as well. I was trying to compare these JP and UK deer figures but it’s difficult to do so using stock pictures. My friend Toukkero has a JP set while I have the UK set so perhaps we can take similar views and compare them side-by-side in the forum. We’ll see. For now, here are some the pictures of the JP Red Deer family I found on the net from various sources, with my own red deer UK figures’ pictures taken today. I hope Toukkero can add more insights to this but as far as I can tell, the differences lie in their clothing. Also, Mother Deer has a cloth flower in her coat in the JP figure but the UK figure has a flower bead. Beyond that, they look pretty much the same to me. Even the babies are patterned after JP babies (one crawling/ one sleeping) and not the usual Flair twins that sit and crawl. All in all, the differences seem minuscule and not enough cause to own two sets of the deer from different SF manufacturers. But I’m not making a promise! I had been waiting for this for weeks. 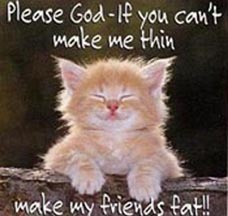 Too bad it had to fall on the week I fell ill. 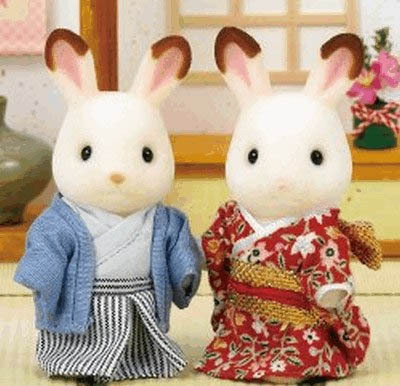 Nevertheless, I promised A that I would be well enough to join him even for a few hours that day for our Sylvanian Shopping Day. I was a bit dizzy early on in the morning but my fever was gone. I took in lots of water, downed a decongestant, and pumped myself up with a megadose of Vitamin C and zinc. Those seemed to do the trick because I was already feeling bright and chirpy an hour or so later. Before traffic got too bad, we left the house with plenty of time to spare for the mall’s opening. 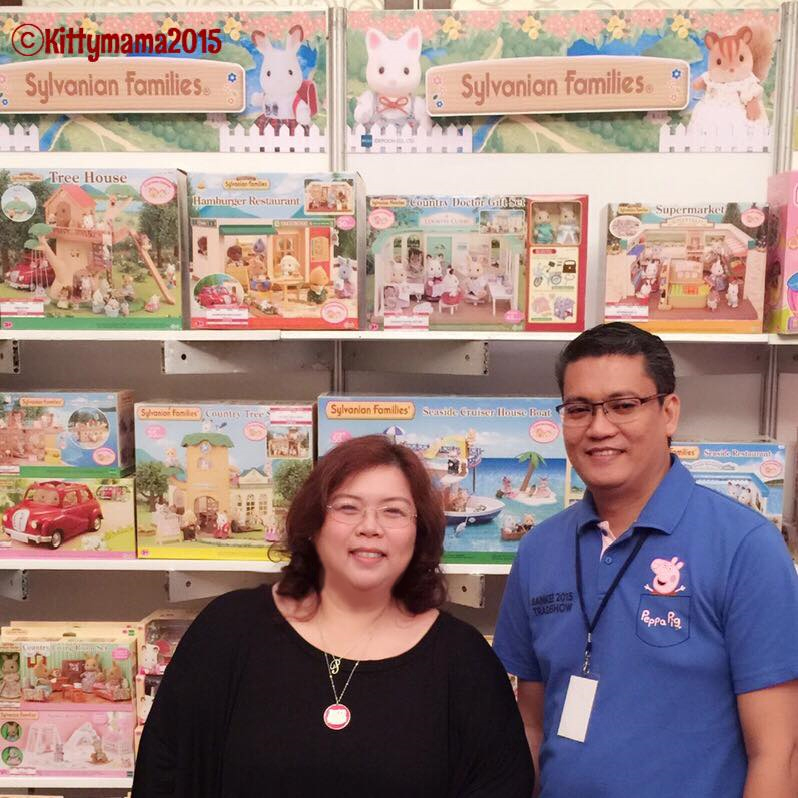 Our destination: Toys”R”Us at Level R3 of The Power Plant Mall at Rockwell Center, Makati City where a new Sylvanian display will be on exhibit from Saturday, November 19, till the end of December. Toys”R”Us Rockwell Center used to be Kidz Station until TRU bought them out. The new TRU at Rockwell still looks pretty much the same, except you can now see TRU’s logo just about everywhere. The market of this particular mall is definitely upscale as it lies very close to posh residential communities, five-star hotels, and other ritzy commercial establishments. As such, even TRU markets itself vigorously to this segment, providing more varieties and more brands in this store than any other TRU I’ve visited, with the exception of TRU Robinson’s Galleria. The latter is a flagship store of the Robinson’s Retail Group, the company that brought TRU to the Philippines in alliance with Li & Fu Retailing, the Asian franchisee of TRU. The trip to the mall was definitely worth it! 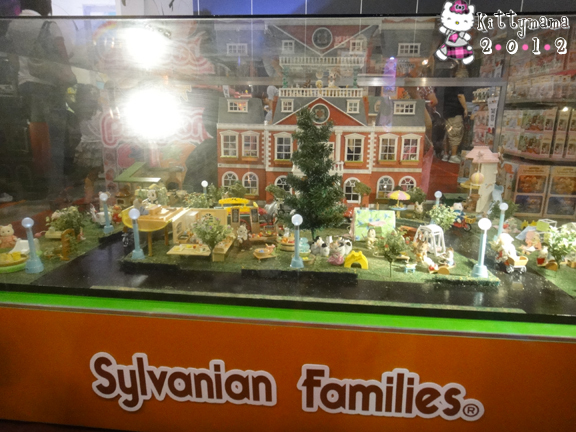 The new Sylvanian display is absolutely beautiful and I had a great time looking at it. 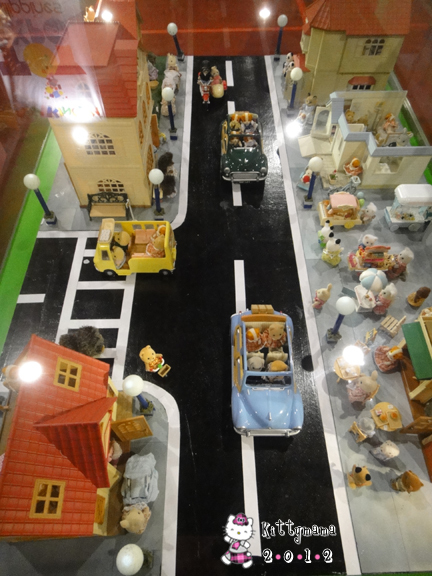 For SF fans like me, seeing dioramas created for the purpose of highlighting Sylvanian Families products is always a treat. Part of the thrill in collecting is the satisfaction that comes with having created your own dioramas and tableaus. As cute as they are, working on them is a lot of tedious hard work. You have to get the perspective right, you have to make sure the accessories are all in, and you have to arrange them so that they look natural and not staged. If you’re interested to see samples of fabulous works online, you can check out Toukkero of Monte Suloista Kokoelmaa who makes some of the loviest mini-displays I’ve ever seen. 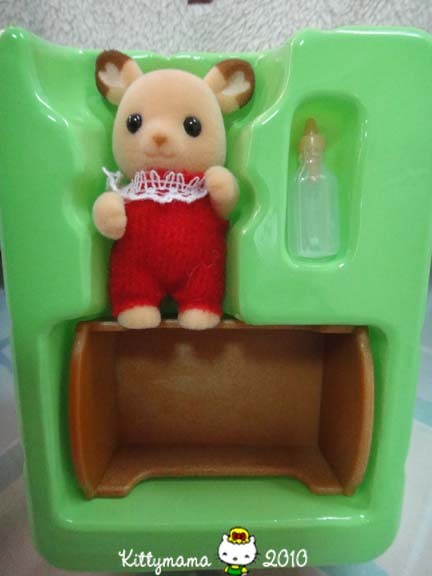 There’s also Beverly of Carrot Creek Sylvanian Villages who not only makes gorgeous tableaus but picture-perfect videos (Carrot Creek Sylvanian Videos) as well. 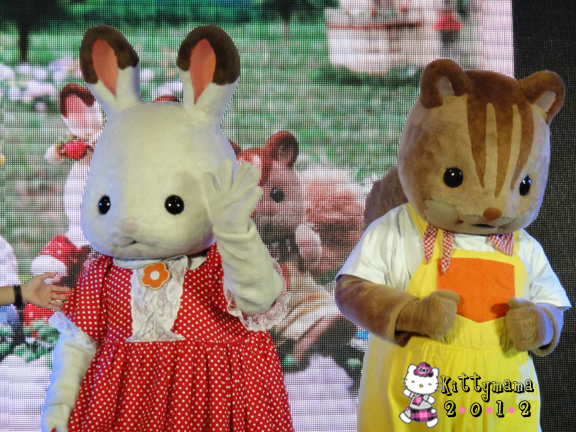 On Flickr, you can check out bbqweasel‘s fusion of Sylvanian Families and Pinky St. characters. And if you’d like to see pictures and stories that range from the humourous to the heartwarming, you can check out Panda Patch, My Sylvanian Love, and Sylvanian Home. You can go through more on the list on the links beside my page. 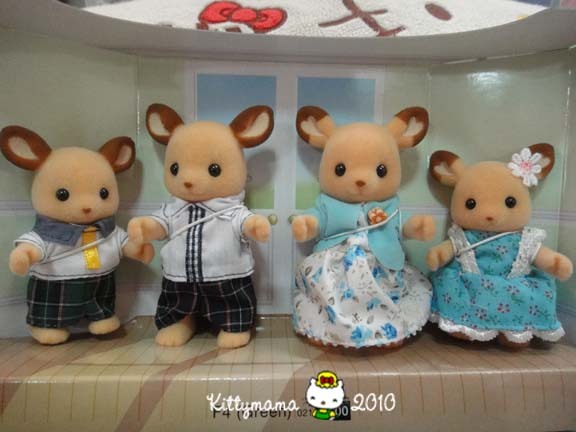 Sylvanian Families collectors are some of the most creative persons I know. Kittymama gets in the actiion! A, always generous, got me all the items I still don’t have. Although I was expecting JP items, the new releases didn’t disappoint and I was mighty glad we have new buildings to complement the existing line. Besides, the new deer family and babies are divine! I’m happy that the elephant babies have also reached our shores; now, if I can only convince Ban Kee to bring in the Grandparents at Home sets! Had to update this picture as I missed a box! 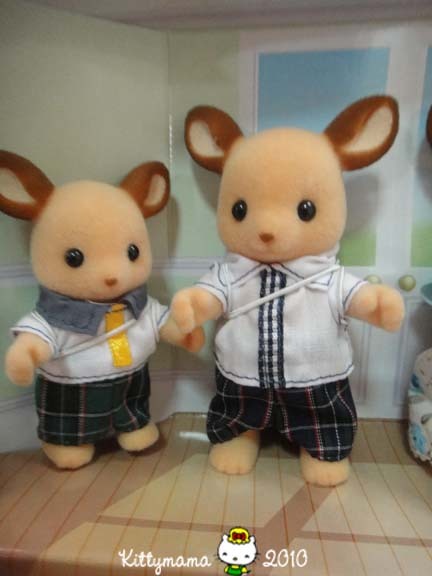 There’s a twelve-year-old boy out there named John Lenard who’s also crazy over Sylvanians (Hi, John! I know you read my blog!) and for him, I also took a picture of this value pack which was available. I didn’t get this one as I have these items in separate sets. But John likes them all so I think he’ll try to convince his parents to get them all for him. 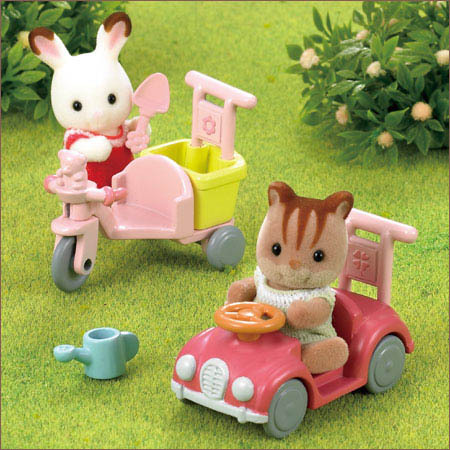 In the end, for all its excitement and surprises, Sylvanian Shopping Days are most fun because I share them with A. I never go anywhere without him, really, and for one who’s not really keen on SFs (or Hello Kitty! ), his patience, generosity, and gift of time are amazingly limitless. His constant support for his wife’s silly fancies is absolutely priceless. I am eating humble pie. 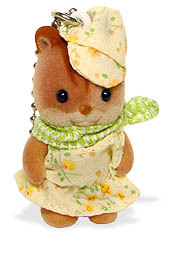 Whe I first wrote Sylvanians for the Masses, I must admit that I didn’t get Epoch’s marketing strategy on their new EU releases. It felt like a backward step for a company that has been producing finely crafted toys for 25 years. And so, while I appreciated the additions to my collections (you know collectors, they’ll collect just about anything even remotely related to their area of interest), I wasn’t in a hurry to acquire them all and when I did, I wasn’t at all that thrilled to open them. So they simply lay in wait in their sturdy card cases till I could summon enough interest to play with them. Moreover, he “sees no cannibalization” and considers this decision to broaden market segments as protective of the primary line. In this case, while he talks of a different matter altogether (he bases his opinions and recommendations on a case of appliance makers who introduced second-tier brands to counter cheaper brands in the market), I can clearly make the connection to this particular case of Epoch and their mass-market Sylvanians. But how do I get over the “lack of prestige” of the new line? It seemed unlikely, at first, to find anything good to say about them. The only thing they had going, I thought, was the low-cost factor. The answer was simple: open the box and play with them. And I did. Humble pie has never tasted as good as this. They’re not photogenic, mind you; either that or my photography skills are not enough to showcase them at their best. Their clothes seem too simple and lacking in charm. 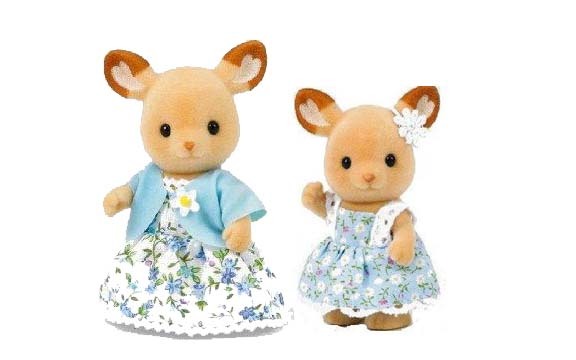 They have single colors and none of the distinctive markings of more refined Sylvanians. But when you do take them out of their packaging, you will fall in love with them! Their flocking is amazingly plush and thick, making their coat seem luxuriant compared to their Flair and Epoch JP kin. The joints are well manufactured and none of them are too tight, or worse, too loose. Their clothes, which seem simple and unstructured, are soft to touch and made of good quality material. Instead of ribbons to tie clothing, these use garterized straps that are easy to loop over bodies and heads. Best of all, these critters have got the cutest tails ever! I am four sets short of the entire line and only because I have yet to see the sister with accessory boxes shown below. The furniture sets are made of good quality plastic that is not brittle and easily broken. They have no sharp corners or edges. They adhere to original furniture designs and while they did away with the tiny accessories, they did not scrimp on detail. The piano, for example, has a moving keyboard. The closet doors of the sink/counter open, as also the little drawers of the desk and chair set. The dining table and chairs feature designs in relief on the tabletop and chairs’ backrests. Perhaps the only things that are missing are paddings for the sofa, bed and baby crib, but even those can be easily remedied by a crafty person. The beginner’s set is actually a version of the newly released JP Sycamore Cottage. This set features a gray rabbit sister with a bed and a square dining set (table with two chairs). 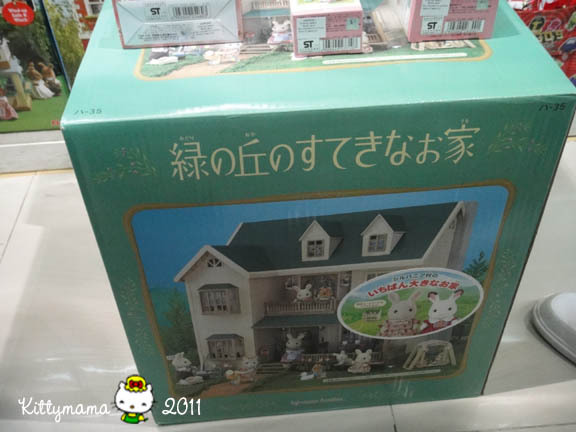 At just PhP1500, it is cheaper than the starter set featuring the Chocolate Rabbit sister (then again, the latter has more furniture and accessories). 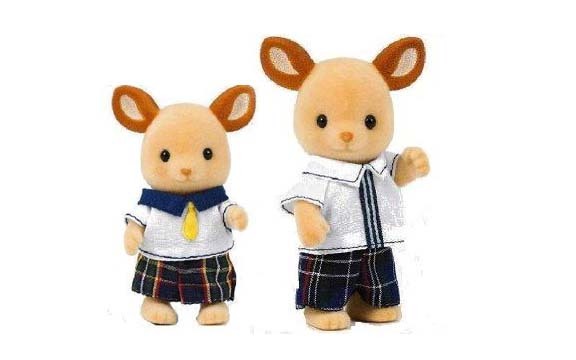 Ban Kee Trading, the company that distributes Sylvanian Families in the Philippines, released this with the purpose of introducing Sylvanians to young kids. Because this line is both parent- and child- friendly, they see this as a way of opening the market to new collectors who might want to continue collecting even as they get older. Moreover, the single furniture sets allow parents the flexibility to plan their purchases according to their budgets without ever sacrificing quality. All in all, this new line complements the existing JP and UK lines very well. 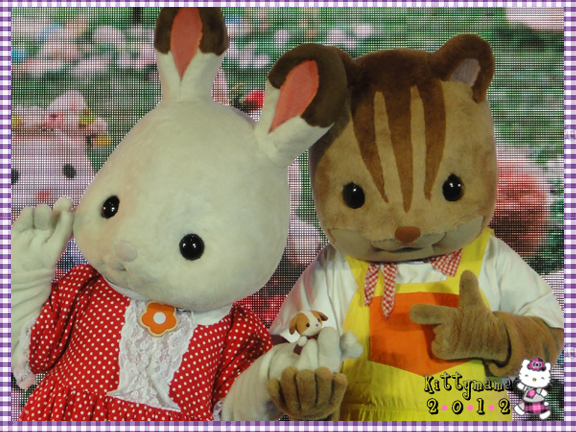 I’ve grown to love these new Sylvanians as much as my standard ones. They may be different, but different isn’t necessarily bad. Three more days before the giveaway entry period ends. Please join and get the chance to win cool prizes!